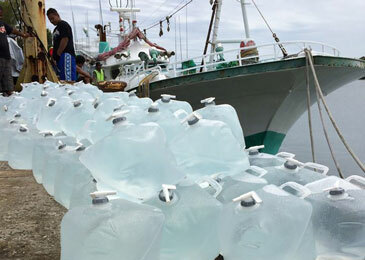 Federated States of Micronesia (FSM) is reviewing its disaster response in the wake of the three typhoons which hit the country between April and May this year. The review, which involves representatives from the four states of FSM and partners, including the Secretariat of the Pacific Community (SPC) and the European Union, is part of the Second FSM Disaster Risk Management Platform being held in Yap State between 8 and 12 June, 2015. In April this year, typhoon Maysak severely impacted Chuuk and the outer islands of Yap. This was followed by typhoon Noul , which hit the main island of Yap. Typhoon Dolphin caused heavy damage on Kosrae and Pohnpei in May. The Second FSM Disaster Risk Management Platform is funded by the European Union, as part of the Building Safety and Resilience in the Pacific Project, implemented by SPC. The forum is being led by the respective state disaster coordinating officers, and assisted by staff of the Weather Service Office and Red Cross. Representatives of women’s associations and associations for persons with disabilities are also part of the programme, which aims to capture a holistic view of how the typhoons impacted particularly vulnerable groups. The review seeks to understand the unique challenges faced by these groups during disasters, and to develop practical solutions that will be included in state work plans to address future disaster response. The unique challenges faced by persons with disabilities during disasters include deaf people not hearing warning alerts, and blind people and the infirm who require assistance to respond to a rapidly developing emergency. The outcome from the First FSM DRM platform, held in 2014, is also being discussed in order to assess the progress that has been made in disaster response by the four FSM states. The Sendai Framework for Disaster Risk Reduction, which was adopted at the Third World Disaster Risk Reduction Platform in March this year, will be presented to the platform by the Office of Environment and Emergency Management (OEEM). National government departments, bilateral and donor partners and foreign embassies will present their respective programmes and projects, to enable the states to embrace assistance and support that is available to set priorities and enhance safety and resilience in the face of climate change and disasters. Each state is expected to develop a disaster response work plan for the following 12 months. The platform was opened yesterday (Monday 8 June) by the Yap State Governor, Hon. Tony Ganngiyan, with an opening address by the Director of SPC’s North Pacific Regional Office, Gerald Zackios. The ACP-EU Building Safety and Resilience in the Pacific is a European Union-funded project (€19,367,000) implemented in partnership with SPC. Its objective is to reduce the vulnerability, as well as the social, economic and environmental costs of disasters caused by natural hazards, thereby achieving regional and national sustainable development and poverty reduction goals in 15 Pacific countries of the Africa Caribbean Pacific (ACP) group of states.